Justice Minister Shaked reveals plan to delineate Supreme Court's boundaries and authority, allow gov't to choose justices, legal advisers. 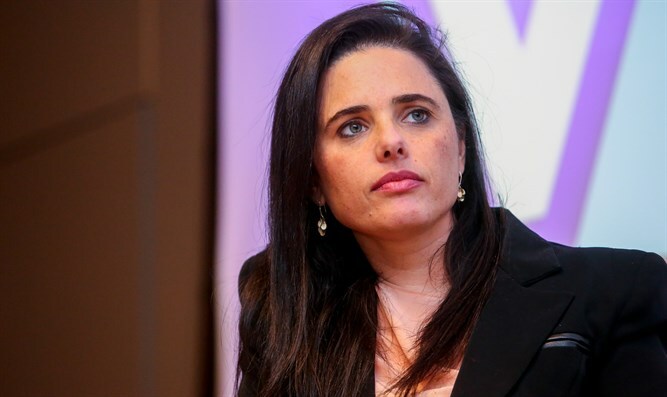 Justice Minister Ayelet Shaked (New Right) on Monday morning announced her "Hundred-day plan" to revolutionize the judicial system, to be implemented immediately following the April 9 elections. Speaking at an economy conference, Shaked said, "We've gathered here to talk about economics, competition, and freedom. But there is no freedom and no competition without governance, and the economy cannot flourish if no one takes responsibility." "In 1977, the Israeli left lost its grip on Israeli politics. Instead of changing the nation, the sinking hegemony changed the Israeli democracy's center of gravity - the Supreme Court joined the political arena. Starting from the 80s, a new generation cemented itself in the Supreme Court. Instead of respect for legal tradition and the conservatism which characterized former judges, the court took a new perspective, viewing the law as all-encompassing and the Supreme Court as the highest authority." A short time after the changes became entrenched,"the constitutional revolution was completed with no disturbances" and the Supreme Court became the final authority for political issues. Naturally, "any policy which was not previously approved by legal advisers did not receive the protection of the Supreme Court. In the name of a blurry public interest decided in the halls of legal advisers, the concrete public interest, decided at the polling stations, was pushed aside. Israeli democracy has changed and become unrecognizable. The people have become irrelevant." Shaked also presented her plan for revolutionizing the system: First, disbanding the committee for appointing Supreme Court judges and replacing it with the following process: The Justice Minister presents a candidate for approval by the government and the Knesset; then, holding a public hearing for Supreme Court justices. The third step would be to pass the Override Clause in its full format. Fourth, allowing ministers to represent themselves in court, regardless of what their legal advisers say, and finally, passing the Attorney General Law. "The first and most important part of the process is to change how Supreme Court justices are appointed," Shaked said. "In the vast majority of Western democracies, publicly elected figures are the ones who choose the judicial system's highest echelon. There's no reason we should be left behind. It is unthinkable that in a strong democracy such as Israel, justices should be able to bar someone from becoming their colleague. The people will take full responsibility for this. Choosing Supreme Court justices will be done at the directive of the government, by suggestion of the Justice Minister, and with the approval of the Knesset." "At the same time, the Constitution, Law, and Justice Committee will hold a hearing for the candidates. "Sunlight is the best way to clean things. The public deserves to know what each Supreme Court candidate's legal views are. "The second process is the completion of the Constitution. Basic Laws delineate the Knesset's and government's authority, but an additional process is necessary to cl early delineate the Supreme Court's authority. Basic Law: Legislation will include the Override Clause. The 'dialogue model,' similar to Canada's, is the most appropriate for the State of Israel. "The biggest advantage in this is that the Supreme Court will no longer be seen as taking an active role in politics and having the last word. I am sure that this will return the Supreme Court to its position in settling disputes between citizens and protecting the rights of citizens harmed by the government. I am sure that this will bring the public's trust in the Supreme Court back to the level it was before the [court's] revolution. "The third process is clearly cementing the Attorney General's authority in law. The Attorney General changed many years ago from an adviser to a policymaker. Sometimes, he lobbies against the government instead of backing it. "We will complete the process I started to change the way the Attorney General and legal advisers are appointed to the government and its offices. We must go back to appointing the Attorney General the way we did for many years - by decision of the government and suggestion of the Justice Minister. At the same time, we will complete the Attorney Generals Law. It is unthinkable that a minister in Israel's government should have no official involvement in who becomes his legal adviser. Believe me, the political echelon is interested in succeeding at its tasks. It will choose the best legal adviser - and yes, it will choose someone whose views match its own. "This is, in a nutshell, the judicial plan which I believe in. During my current term, for the first time in dozens of years, the public voted right and received right - economic right, and political right. The democratic revolution started just four years ago. I hope the public chooses to continue it, and to return the authority to their elected officials. I am a big believer in democracy, a big believer in the nation of Israel, and a big believer in its choices."